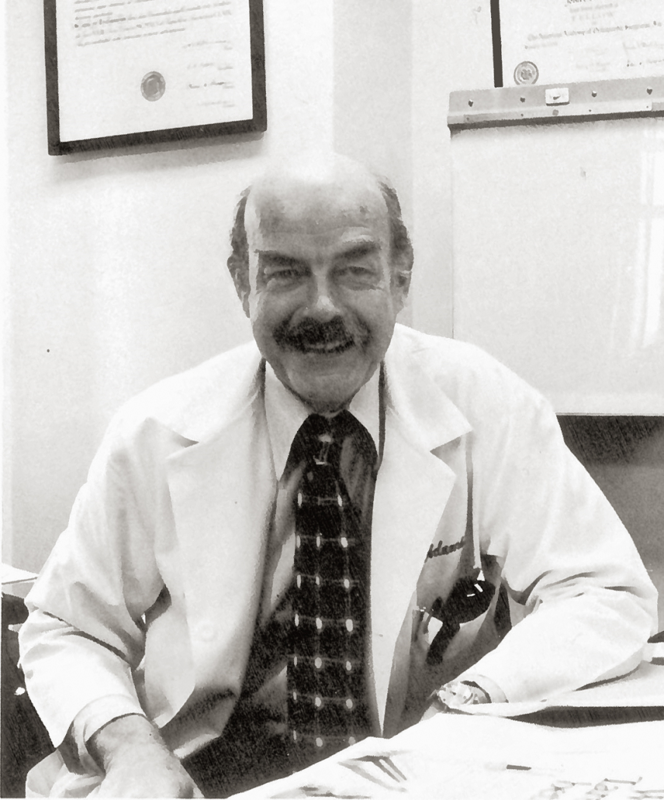 John Adams, M.D., Professor Emeritus of Orthopaedic Surgery and of child health and development at the GW School of Medicine and Health Sciences (SMHS), is, simply, a trailblazer. He’s traveled the world, both as a soldier with the military and as a physician on global health missions, and evidence of his richly lived life is clear in his home. A bust of his likeness is sandwiched between paintings from Asia, and Adams, during an interview on Nov. 3, 2015, points out other items, some from the early days of his marriage to his late wife, Nancy, Ph.D. ’68, M.A. ’61; they married in Nanking, China, in 1948 and later moved to Japan, where Adams, a medical officer in the U.S. Army, was stationed. His anecdotes span his time from college at the University of Missouri, followed by Washington University and Duke University, through his role as chair of the SMHS Department of Orthopaedic Surgery, a position he held from 1953 until his retirement in 1987. The luminaries of the time — Brian Blades, M.D., Lewis B. Saltz, M.D., Eugene Meyer, Walter A. Bloedorn, M.D., Hugo V. Rizzoli, M.D. — are present in Adams’ stories, as are the developments in research and technology that the now 93-year-old hand specialist, who also prioritized children's orthopaedic problems, was witness to. What was the Department of Orthopaedics like when you first took the position of chair and professor? Our teaching program early was centered on DC General Hospital. The medical schools each had a service at DC General, so the students would rotate through there, and we set up a post-graduate teaching program involving DC General and Veterans Hospital and GW Hospital. After DC General closed, the teaching took place at the GW, Washington Hospital Center, Children's Hospital [today’s Children’s National Health System], and the Veterans Hospital, and we had services that were off and on at Fairfax Inova Hospital. We also had elective programs at Oxford University, the University of New Zealand, the National Institutes of Health clinical center, the National Bureau of Standards, Massachusetts General Hospital in Boston, and Roosevelt Hospital in New York City. Other than our clinical teaching, we did our research labs wherever we could find a lab at the Veterans Hospital, some of the labs at GW, and some of the services at DC General. We had two research labs, one in collagen chemistry and one in biochemistry, and we later awarded 102 Ph.D.s in biochemistry. What was some of the research you conducted? We set up a lab in collaboration with Harvard University, where we did research in collagen vertebral disc. We also did research in Dupuytrens Contracture, an inherited disease that affects your palm, and we established the biochemical nature of Dupuytrens Contracture. We conducted studies in the pathophysiology of compression injuries to the extremity, as well. What were the technological advancements you saw or were a part of? One of the big changes in orthopaedic surgery was the development of total joint replacements. GW had the first, and I had the first license to do total joint [replacement]. We did the first ones in Washington D.C. Techniques changed over the years; before, joint reconstruction usually was either resection or arthrodesis [a joint remodeling technique using bone grafts in an effort to alleviate pain]. One of the other things that changed was anesthesia. Actually, we developed the most commonly used anesthesia for upper extremities surgery, and [now] it’s [used] around the world: xylocaine. We were the first to use it for relective surgery, and we did research on distribution. We developed and set up the standard protocol for using it, and as I said, it’s the most widely used type of regional anesthesia now. So that was one thing we did. We also saw advances in arthroscopy and microsurgery; we had a microsurgery lab over the Warwick building for many years. We’d go spend our weekends operating on rats. [Additionally,] we would use the operating microscope mostly for nerve repairs and so forth, and we did some research in nerve healing and nerve repair using the operating microscope. We also did the first scientific study on the volume of blood in the legs in 1959-1960. About 10 percent of your blood volume is in each leg; that’s why you keep people out of shock by putting their legs up in the air, put some blood back in the blood system. A lot of our research, because the way things are set up where it's kind of episodic, we'd have, I think, good ideas and do them. We published a paper on emergency room treatment with antibiotics and minor and major lacerations and found out it had no positive values. Outside of GW, what medical activities or committees were you involved in? Some of the interesting things; I served on many committees actually, and I was president of the American Society [of the Surgery of the Hand] from 1971 to 1972. I also helped establish the Orthopaedic Referral Center in Tunisia. I spent about 10 years working with this program, and we built a big center at the University of Tunis. There was an opportunity to go various places [with Care Medico, which no longer exists], and one of the opportunities was Tunisia, which I selected and went there first in 1964 and, I think, 1966, and I continued until 1976. I was able to bring post-graduate students from the United States, for periods of six months or so, to the Tunisian city, to work. Additionally, after Tunis, we had support from the U.S. Department of Health, Education and Welfare in funding ortho residents to work in Tunisia. What kind of legacy do you feel you’ve left? I continued as chairman until June 30 of 1987 when I retired, so it's a little over 34 years. During that period we were able to establish a good teaching and residency program. I think I trained about 60 residents by the time I retired; probably another 40 or 50 by now. We had a good research program going. We basically went from a division of General Surgery to a well-recognized department and training program. I think it will continue to grow, [but] the whole practice of medicine is kind of confusing right now. With so many new government regulations, it’s lost so much of its intimacy. I think that, basically, [GW’s orthopaedic program] will do well, at least clinically and maybe develop some research possibilities. It’s too early to say because it takes a long time to get settled in and find out where you can do things. The Department of Orthopaedic Surgery at the GW School of Medicine and Health Sciences is the premier program in Washington, D.C. The residency program, which accepts four residents per year, prepares medical school graduates for success at the level of a board-certified orthopaedic specialist. Not only do faculty foster the development of residents’ expertise in patient care and medical knowledge, but they also prioritize professionalism, interpersonal skills, practice-based learning, and an understanding of health care systems. Residents also receive training in basic science and clinical research in orthopaedics. After completing rotations through Children’s National Health System and other community-based hospitals, many residents choose to pursue advanced training through a fellowship in their chosen specialty.